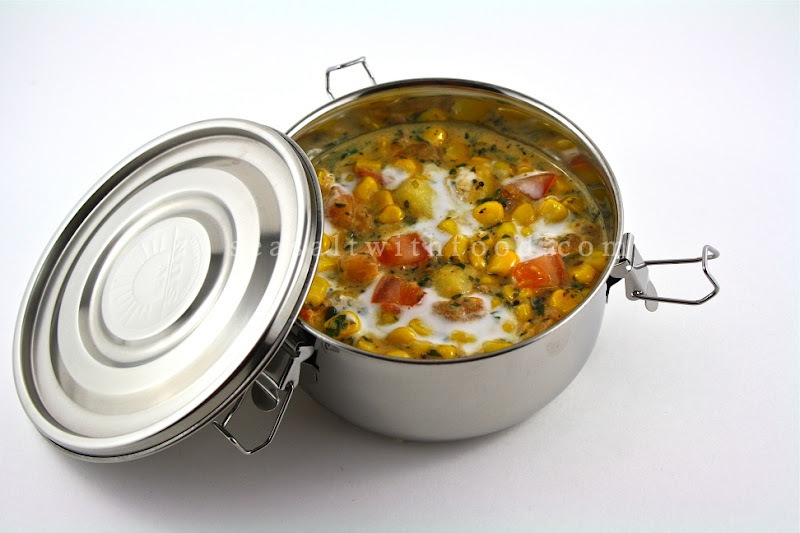 Today, I’m posting a recipe for Sweet Corn and Potatoes with Mustard seeds and Mint. 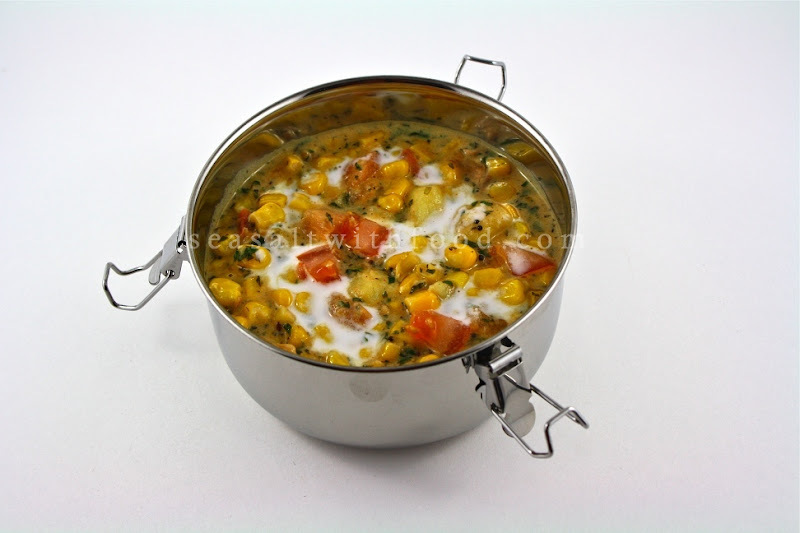 It’s best to use fresh summer corn for this dish. But, if you can’t get hold of the fresh corns, then just substitute with good quality frozen summer corn, which is what I used here incidentally. This sweet corn dish has sweet, hot, and sour flavors. It’s great with any Indian meal. Put the oil in a large, preferably non-stick, frying pan and set over medium-high heat. When hot, put the mustard seeds and cumin seeds. As soon as the mustard seeds begin to pop – this takes just a few seconds – put in the garlic and potatoes. Stir and fry until the potatoes are lightly browned. Then mix in the tomatoes, fresh coriander, mint and chili. Stir and fry for 1-2 minutes. Add in the sweet corn and stir. Pour in the coconut milk, sea salt, cayenne, and lemon juice. Stir to mix and bring to a simmer. 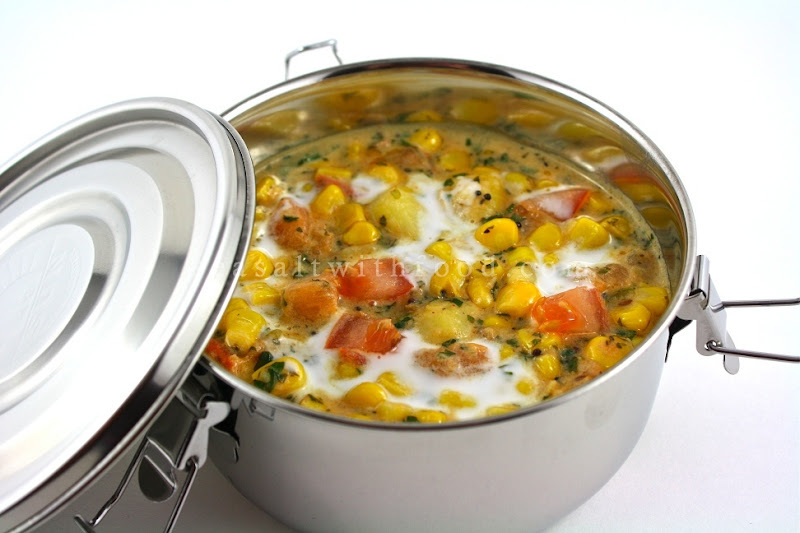 Cover, turn the heat to low and cook for 3 to 4 minutes or until the sweet corn is cooked. Uncover; add some black pepper and the ground roasted cumin seeds. Stir to mix, and taste for the balance of seasonings. I like your tiffin type container! This sounds yummm.. lovely and colorful!